Allan Houser's monumental tribute to Native Americans, As Long as the Waters Flow, was dedicated on June 4, 1989. Among those in attendance was legendary Comanche medicine man George Woogee Watchetaker, traditional Indian flute players Doc Tate Nevaquaya and Woodrow Haney, as well as Governor Henry Bellmon. Watchetaker led a prayer of dedication and conducted a native ritual by use of smoke from burning cedar chips and sage. The traditional elements of the dedication held true to the powerful meaning of legacy within the statue. As Long as the Waters Flow refers to President Andrew Jackson's vow to Native Americans that they shall posses their land "as long as the grass grows and the rivers run." The 13-foot, 6-inch bronze statue exudes Houser's artistic style. Lacking intricate representative detailing, the large solid planes among the surface denote strength within an everlasting presence. Her traditional attire is complete with an eagle feather fan, which is considered a sacred symbol among Native American cultures. Born on June 30, 1914, Allan C. Haozous was to become known as Allan Houser, one of the 20th century's most important artists. Allan's parents, Sam and Blossom Haozous were members of the Chiricahua Apache tribe who were held as prisoners of war for 27 years. 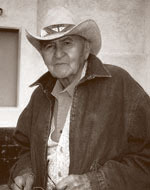 Allan's father was with the small band of Warm Springs Chiricahuas when their leader, Geronimo, surrendered to the U.S. Army in 1886 in the northern Mexican state of Chihuahua. In retribution for the Warm Springs Bands' refusal to leave their lands in New Mexico and relocate to a reservation in Arizona, 1200 Chiricahuas were sent by cattle-car train to prisons in Florida. Allan's father was among the children and women jailed at the Castillo de San Marcos in St. Augustine, Florida, and Allan's mother was born in the prison camp at the Mount Vernon Barracks, Alabama, where surviving members of the tribe were sent in 1887. As a final solution, the last of the Chircahuas were sent to Fort Sill, Oklahoma, where they remained captives for 23 years. Freed at last in 1914, a majority of the tribe returned to New Mexico to join with the Mescalero Apaches for whom a reservation had been created. Allan's parents, however, were with a small group of families who chose to stay in Oklahoma and create farms in the Apache and Lawton communities. Allan was born just months after their release, the first child born out of captivity. Growing up on the farm, Allan labored with crops of cotton and alfalfa and helped support the family growing vegetables and raising livestock and horses. At an early age he became interested in the images he saw in magazines and books. He soon began making his own drawings and carvings. In 1934, a notice for an art school in Santa Fe attracted his attention, and he enrolled in the Painting School at the Santa Fe Indian School. Commonly known as the Dorothy Dunn School after its prominent teacher, Allan became its most famous student and by 1939 his work was exhibited in San Francisco, Washington, D.C., and Chicago. In the same year he received a commission to paint a mural in the Department of Interior building in Washington, and its success led to a second mural commission there in 1940. Allan married Anna Marie Gallegos in 1939, and together with three young sons they moved to Los Angeles in 1941 where Allan sought employment during the war effort. It was here that Allan would have the opportunity to visit museum exhibitions of European modernists such as Brancusi, Arp, Lipschitz, and Henry Moore, whose work would have a lasting influence on Allan as his own style evolved in the succeeding decades. 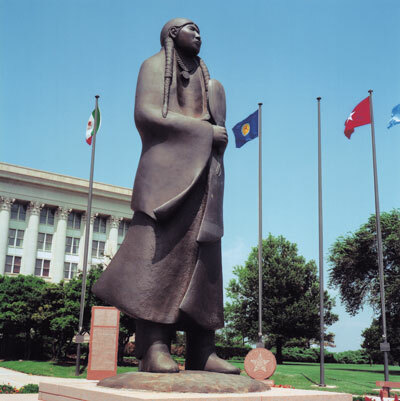 In 1947 Allan was commissioned by the Haskell Institute in Lawrence, Kansas, to do a memorial sculpture honoring the Native American students from Haskell who had died in World War II. Completed in 1948, this work entitled "Comrade in Mourning" was his first major marble carving. In 1951 Allan moved to Brigham City, Utah, where he taught art at the Inter-Mountain Indian School for the next eleven years. He continued to paint and produce small wooden sculptures, and in 1954 he was honored by the French government with the Palmes d'Acadamique for his outstanding achievement as a teacher and artist. In 1962 Allan was asked to join the faculty of the newly created Institute of American Indian Arts in Santa Fe. There he created the sculpture department and began focusing his own artistic output on three-dimensional work. As he taught and created sculpture he began integrating the aesthetics of the modernists with his narrative ideas. By the late 1960's he began exhibiting this sculpture and recognition of his unique style grew. Museums and private collectors sought out examples, and his influence became apparent on hundreds of students and other artists. In 1975 Allan retired from teaching to devote himself full-time to his own work. In the two following decades he would produce close to 1,000 sculptures in stone, wood, and bronze, and emerged as a major figure on an international scale. He had nearly 50 solo exhibitions in museums and galleries in the United States, Europe, and Asia, and he continued working tirelessly until his death on August 22, 1994. Visitors are permitted to photograph the artwork at the Oklahoma State Capitol, however all works are copyrighted and cannot be reproduced without permission. To request permission to reproduce a work of art, please download this form (coming soon) and submit it as instructed. Requests generally require four to six weeks to process. The Oklahoma Arts Council is the official state agency for the support and development of the arts in Oklahoma.